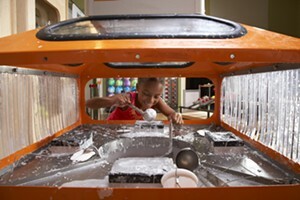 How People Make Things | ECHO Leahy Center for Lake Champlain | Ongoing Exhibits | Kids VT - small people, big ideas! This temporary exhibit explores the story of how familiar childhood objects are manufactured from raw materials into finished products. Visitors step onto a factory floor for hands-on cutting, molding, deforming and assembling activities, and create objects to take home. Regular museum admission, $11.50-14.50; free for children under 3. Through September 3.